There’s fish and then there’s FISH. The fish you see at your local chain grocer is, well… edible. Good fish should taste like diving into a silky wave of the Pacific Ocean, the water enveloping you in its sweet saltiness, rays of sun glistening on your face as you come up for air before diving back in again for another bite. That’s what fish should taste like. Where can you find such a seafood experience? Catalina Offshore. Catalina Offshore Products has been a staple in San Diego for forty years. It began as most great stories do: One person with a passion who becomes well known for doing that one thing really well. Back in the 70’s, owner Dave Rudie spent his days diving for sea urchin off the shores of Catalina Island (hence the name). He sold his harvest right off his boat. He later began processing out of his garage and eventually grew to need a much larger facility. 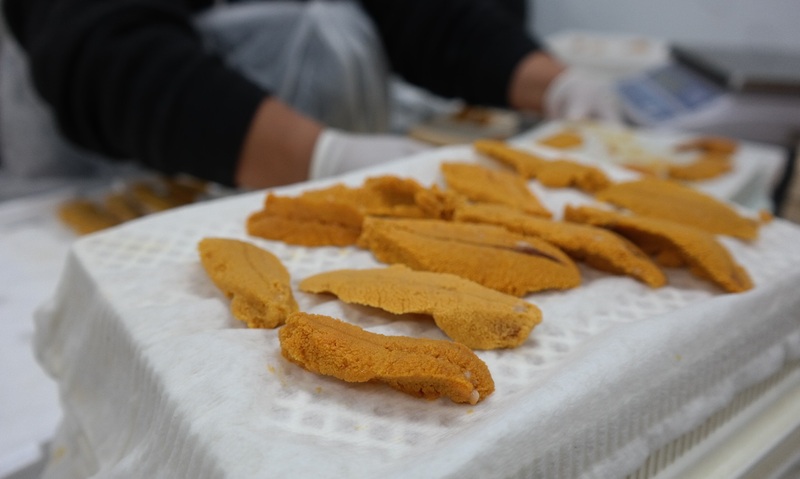 Today, Catalina Offshore is a premier seafood purveyor and one of the largest seafood buyers in San Diego, shipping their products daily around the world. Fish comes in every day to the facility from local trusted fishermen, as well as far off fisheries in places like New Zealand and Norway. Catalina OP isn’t just a wholesaler. Even plebes like you and I can get our fish there! Shoppers range from chefs looking to find something new to serve at a pop up dinner to a couple looking for something fresh and interesting to serve to guests. Walking in the main entrance, you’ll find yourself in the lobby of the offices. Wave hi to the nice sales people and keep on walking to the next set of doors. There, you’ll probably be greeted by everybody’s favorite fish monger and seaman extraordinaire, Tommy Gomes. Tommy tapes educational videos several days a week. 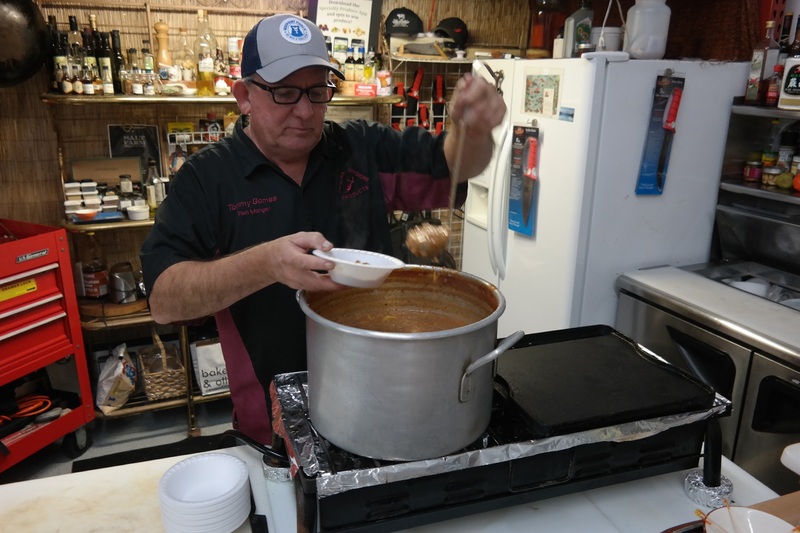 Whatever he makes in those videos becomes samples for lucky seafood shoppers who caught him “on a good day.” On the day I came in, Tommy had just made a batch of the best Ahi gumbo. I like my food spicy and flavorful. That soup really hit the spot. 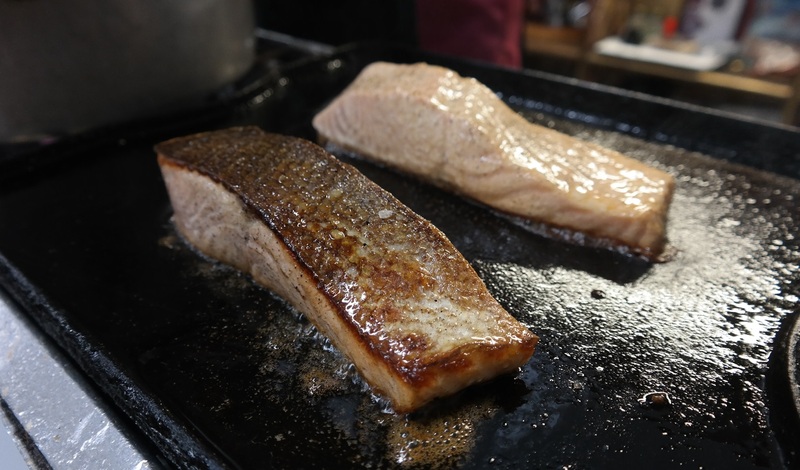 While customers were tasting the soup and deciding on what cuts of fish to take home, Tommy broke out a beautiful piece of salmon from Norway and began to grill it right in front of us, skin on, seasoning only with a bit of salt. “I’m supposed to be at a desk.” Somehow, I don’t see Tommy ever sitting. As I stuffed my face with the salmon, Tommy told me about the buying process at Catalina Offshore. “We don’t cherry pick. We buy the whole load.” That’s how Catalina supports local fishermen. It’s also how they end up with a few pounds of something special every now and then when they were only planning to buy some ahi. “Chefs will call me up and say, ‘I need some tuna, some yellowtail, and whatever else you got that’s fun.” Chefs know that Tommy will make good on that request. Tommy has hosted chefs and their entire teams for some fish fun, focusing on education. The more the chefs and cooks know about the fish, the better the food is going to taste on your plate. Once my belly was full of salmon, I was treated to a behind-the-scenes look at the processing of the fish that made them famous: California Uni. 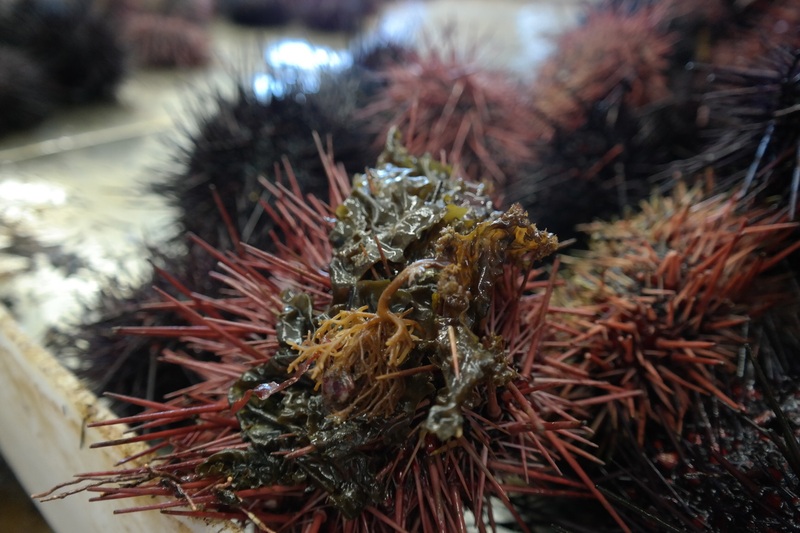 Uni (the ‘meat’ of the sea urchin), the stuff that owner Dave Rudie started selling off his boat nearly 40 years ago, is what made Catalina Offshore internationally known. Their California Uni has been featured on Bizarre Foods America, the LA Times, and even Vogue. What really impressed me was the commitment to sustainability in this process. No part of the uni is wasted. Discards are used to make tropical fish food flakes and chum for sportfishing, and broken, less aesthetically pleasing pieces are used to make sauces and uni butter. The best looking pieces are packed into beautiful little wooden boxes and shipped off to restaurants around the world, including Japan and as far as China. Mmmmmm… that uni just melts in your mouth like butter. So now you know. You don’t have to go to Japan to get the best sushi in the world. We have it right here in San Diego! 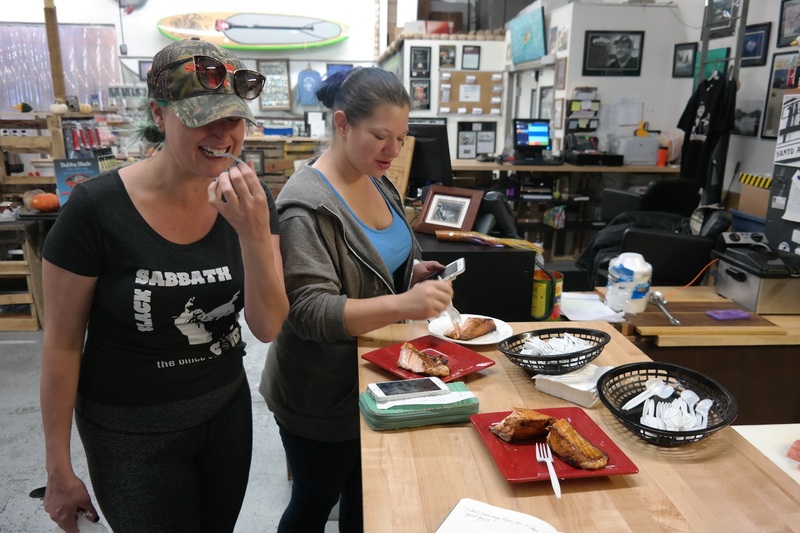 And if you can’t make it down to the shop at Catalina Offshore, you can still taste some of the best fish in the world right here in North County. Land & Water Co. (Carlsbad) – Chef Rob Ruiz is a stickler for sustainability. You won’t even find edamame on the menu at Land & Water, he is that serious about no GMO’s. Located in the old Victorian on the corner of Carlsbad Village Dr. and Coast Hwy, the restaurant took its name from the original tenants from the early Carlsbad days. If you go, try the Water Roll and for an adult beverage, the Hot Kiss. You’re welcome. 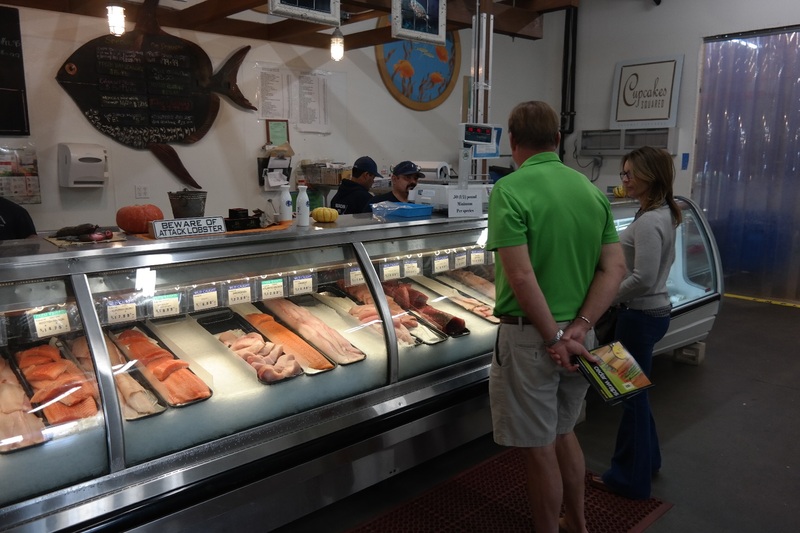 Fish 101 (Leucadia) – They say you should never work with your spouse. We’re really glad John and Jessica Park of Fish 101 ignored that outdated advice. This pair is committed to sustainability, as well. That means the menu changes to adapt to what’s biting. They have daily offerings on a chalkboard, including a “Now Shucking” section, and they’ve got a great happy hour that includes wine on tap and brown bag beer. Wrench and Rodent Seabasstropub (Oceanside) – I don’t want to say that Tommy has a favorite, but he did mention Chef Devin and this hoppin’ new place a few times. Wrench and Rodent‘s claim to fame is their creativity with sushi, using sauces and toppings like arugula chimichurri and a caper tapenade. Per Tommy, “I can’t even get a seat in there anymore!” So you might want to call ahead. 608 Oceanside (Oceanside, obviously) – If I had a nickel for every time I’ve heard, “Oh my god, have you been to 608?” Well, I’d have a LOT of nickels. 608 is the newest buzz worthy place that you just have to try. Walking in, you’d think you were walking into an unassuming wine bar. Don’t assume… or even unassume… Chef William Eick is doing some beautiful things with fish here. There’s a lot of American/Asian/Mexican fusion happening. Be ready to be wowed. Decoy Dockside (San Marcos) – Lake San Marcos FINALLY got an upgrade this year. Not only do they have a great new resort with over the water patios, there’s also a great new restaurant. Decoy is a two-story lake view restaurant and bar that’s a remarkable part of the rehab of Lakehouse Hotel & Resort. The first floor is an indoor-outdoor bar where craft cocktails, beer, and tasty noshings are available to enjoy while soaking up the sun on the patio. Oh, and one last place you can find Catalina Offshore Products… YOUR DOOR! Catalina delivers to the average consumer, too. Fish is carefully cold-packed and Fed Ex’d to your door for a nominal fee. Shipping is free for orders over $300 for non-wholesale customers. So if you’re looking for a great piece of Ahi or maybe even a sushi making kit, you can order online and have it next day. Have you been down to Catalina Offshore? What did you think? Have you tried any of the restaurants we mentioned. We’d love to hear your thoughts in the comments!